Eat Eat Eat at Gwangjang Market! If you want to experience something interesting (especially, in food part) in Korea, why don’t you go to Gwangjang Market (광장시장)? Gwangjang market has a very long history. It started in 1904! It’s over 100 years old. If you go there, you can sense a traditional atmosphere. Gwangjang market is close to Wangsimni (왕십리). There are several ways to go there but the shortest way is taking the subway. Take subway line 2 in the direction of Sang-wangsimni (상왕십리). Next, get off at Euljiro 4 ga station (을지로 4가역). It’s just 4 stations from Wangsimni. Head to exit 4 and just go straight. When you reach the crosswalk, you can see a signboard of Gwangjang market in front of you. What can you do in Gwangjang Market? Well, to start off with, and probably the highlight of this place, is the diverse Korean food one may eat. Particularly, it has three popular menus. 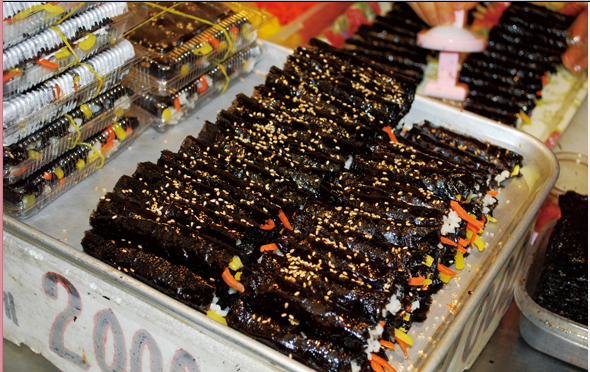 The first one is “Drug Gimbab (마약김밥). You can be startled when you heard that name. However, it’s not real drug ;) “Drug Gimbab” means that it is so delicious that it makes you eat continuously. That’s why it is a “Drug”. It is very short and small unlike Gimbabs you can see elsewhere. Moreover, it doesn’t have many things inside it. Despite these characteristics, it’s very tasty. Many drug Gimbabs stores also sells Tteokbokki (떡볶이) which is rice cake with spicy sauce and sundae (순대) which is tripe with noodles. They are very delicious when you eat them together. You definitely have to try it! The second one is “Yukhoe (육회)”. 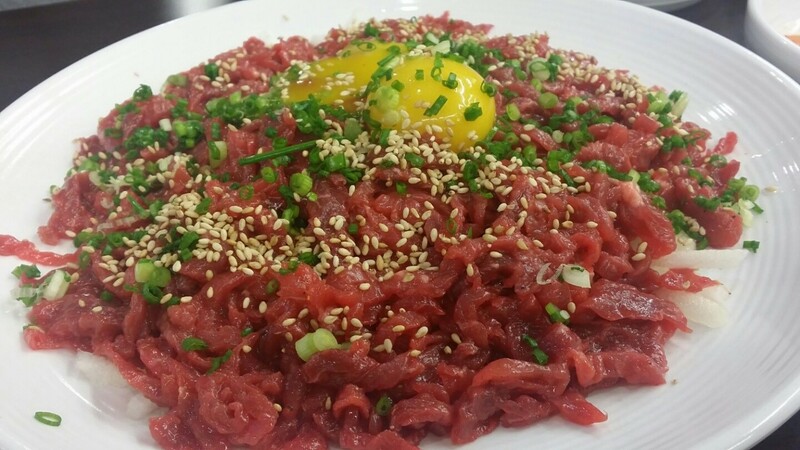 Yukhoe is Korean style raw beef. Koreans eat Yukhoe with raw eggs and sesame oil. Gwangjang market is very famous with Yukhoe. It tastes like sashimi but more tough. Last semester, there were friends who came from western countries and went to Gwangjang market to eat Yukhoe. Actually, they were unfamiliar with raw beef, but really enjoyed it in the end! For exchange students to Korea, I think it is worth giving a try at eating since it would be special experience. The last one is “Bindaetteok (빈대떡)”. 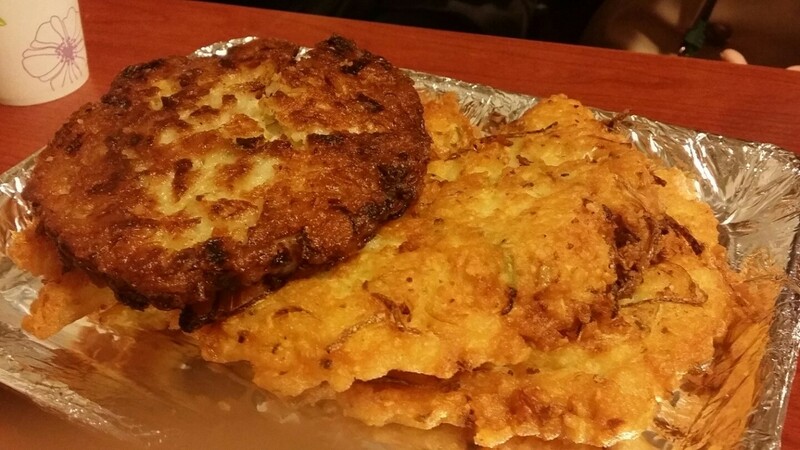 It is something like pancake with vegetables. It is made of mung beans. For comparison, Bindaetteok is not soft like pancake. It is a little bit hard, crunchy, and greasy. However, once you taste this “hard pancake”, you’ll think of it again and again and again. A must to drink with Bindaetteok is Makgeolli which is a Korean traditional rice alcohol, an excellent partner. Gwangjang market is very attractive place to experience Korea. How about going there after class?